Nugget and Fang are unlikely friends. They do everything together--swimming over, under and around. One day, Nugget the minnow heads off Mini Minnows School, and is surprised to learn that sharks are meant to be big and bad. They're also meant to eat minnows--they find them quite delicious. Minnow is disillusioned. Shocked. (And also delicious.) It can't be true. 'My best friend is a shark!' he cries. 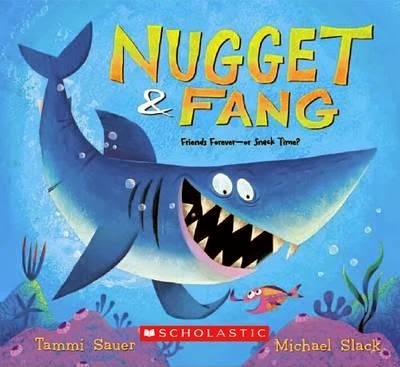 When Nugget tells Fang about his findings, the big shark's heart sinks. He must prove to his friend he's not so scary after all. Perhaps dressing as a mermaid? Offering a basket of seaweed flowers? A tattoo? A song and dance? But nothing works. Nugget is super nervous, and Fang is out of ideas. Can he come up with a way to befriend his bestie and his equally-nervy friends? This is a beautifully-illustrated story (reminiscent of the film Nemo) with a quirky cast of characters kids will love. The plotline may be nothing new but Sauer has injected fun, frivolity, drama and most of all--a solid dose of humour that will thoroughly enchant kids. Fun typesetting, loads of detail and text 'asides' make this a winner for the young set. Parents--also great fun to read aloud.